Remember that moment in the movie Star Trek (2009) when James T. Kirk, Hikaru Sulu and the red-shirted Engineer Olson don spacesuits, and free-style plummet from orbit to a giant machine threatening the planet below? For those who didn’t see it: We hate to ruin the surprise for you, but … Olson didn’t make it. It was an homage to an old joke stemming from Star Trek‘s original series (1966-69). In that show, anonymous crew members in red shirts frequently died to demonstrate how risky a certain voyage was to the main cast. 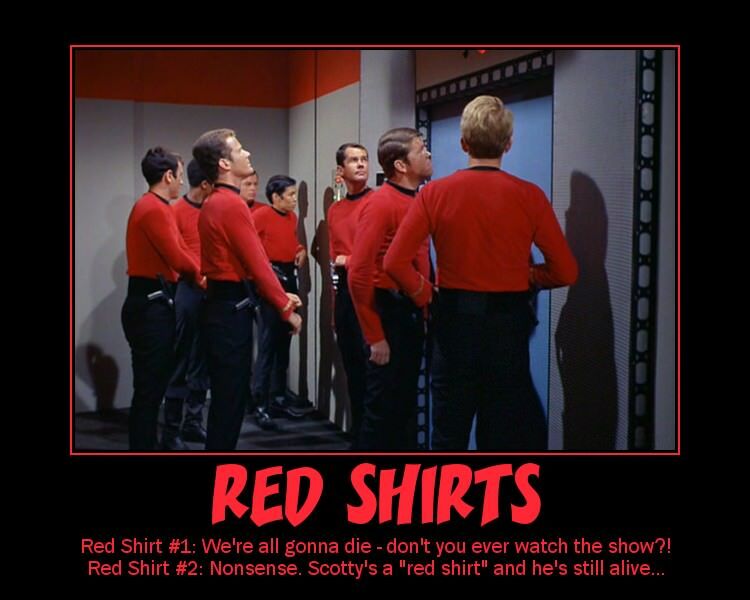 How statistically accurate is that assertion of red shirts dying more often than others? One Star Trek geek – who happens to deal in analytics for a living – put it to the test. His analysis says 73% of deaths in that series were red-shirted crew members. If you’re gonna die, he adds, there’s a better-than-even chance that will happen if you’re a part of a landing party. “Besides not getting involved in fights, which usually proved fatal, the crewmen could avoid beaming down to the planet’s surface, which is inherent to their end,” wrote Matt Bailey, president of SiteLogic, an online marketing consultancy based in Ohio. So the answer is simple, it appears: Refuse to leave the spacecraft. But in Star Trek‘s military-like universe, it’s not that easy. “That could result in a court-martial for failure to obey orders,” Bailey added. So it’s jail, or death. Quite the choice. Bailey then continues his analysis on the best chances for red-shirt survival (hint: it has to do with Captain Kirk’s frequent romantic dalliances – which raises the survival rate by 84%) and how best to present the data on Star Trek deaths. Bailey’s post is more than five years old, but still an entertaining read for Star Trek fans and statistics geeks alike. Lead image courtesy of Star Trek Inspirational Posters. Elizabeth Howell (M.Sc. Space Studies ’12) is a contributing editor for SpaceRef and award-winning space freelance journalist living in Ottawa, Canada. Her work has appeared in publications such as SPACE.com, Air & Space Smithsonian, Physics Today, the Globe and Mail, the Canadian Broadcasting Corp., CTV and the Ottawa Business Journal.